As we know Ford Figo Aspire has got a grand welcome to Indian market, thanks to lots of campaigns and events which Ford conducted before its launch. The Aspire launch in August has done a good impact, the company posting a sales growth of 53% for the month of August. Ford has also hinted that it would be launching the new Figo hatchback plus the new Endeavour. 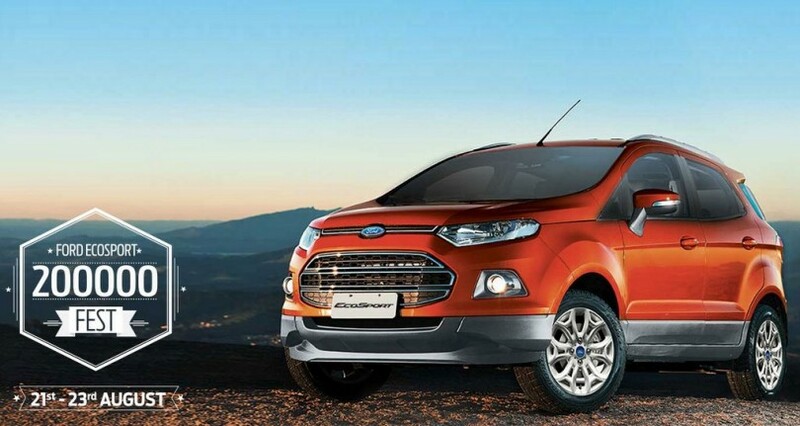 Between all these developments, Ford India is introducing the facelift version of its immesly popular Ford EcoSport. Ford EcoSport is a sub 4-metre compact SUV (Sports Utility Vehicle), which could be regarded as a key car for driving sales for Ford over the years. It has been couple of years since the Ford has launched EcoSport and it has been ageing slowly. It is a perfect time for Ford to tweak its popular car and introduce the facelift version. The festive season is another additional plus to drive more sales for Ford. There are reports that the dealer stocks of the existing EcoSport version particularly present in the high-end trim has high demand from the consumers, and the new consumers are asked to hold till the middle of October. The facelift version of Ford EcoSport’s powertrain options are likely to be same and the EcoSport would continue to be available with 2 petrol engines and the singular oil-burner like before. The arrival of Mahindra’s compact SUV TUV300 could have added some competition in the sub-four metre compact SUV segment. The existing Ford EcoSport range is priced in the range of INR 7.5 Lakhs to INR 12 Lakhs (on-road price) and it is interesting to watch how Ford would price its new facelifted version of EcoSport.